Varnishes are used to protect the finished painting. Picture varnishes should be removable so that paintings can be cleaned when they have become dirty. Do not varnish too early, even the thinnest oil painting should be allowed to dry for 6 months. minimum of one month is required for thin Griffin alkyd paintings. Do not use varnishes as mediums, this would make the painting sensitive to solvent. An attempt to clean it in the future may remove the painting instead! A pale yellow varnish which dries quickly to a high gloss for use on oil and alkyd paintings. Traditionally also used on prints and maps. It tends to darken with aging. It is the traditional high-gloss varnish. A modern general purpose high gloss varnish. It is a clear liquid which dries to a non-yellowing glossy film. It may be mixed with Artists’ Original Matt Varnish to adjust degree of gloss. A superior quality artists’ gloss varnish. Dries to a lower gloss than Artists' Gloss Varnish. Readily removable over a long period of time (up to 100 years) with White Spirit or Turpentine. Dries quickly to a non-yellowing film, does not bloom or crack. May be mixed with Artists’ Matt Varnish. A superior quality artists’ matt varnish which represents the very latest in varnish chemistry. It is water white and remains readily removable for over 100 years with White Spirit or Turpentine. Dries quickly to a non-yellowing film, does not bloom or crack. A superior protective film for oil and alkyd paintings, which dries to a matt finish. Please note that the bottle should be warmed in hot water before use until varnish becomes clear. Removable, wax based traditional varnish. This varnish offers the lowest, most matt finish and remains readily removable. It is a white paste, which is rubbed onto a painting to achieve a soft sheen finish. When dry the surface may be polished with a soft brush or cloth. Artists’ Gloss & Artists’ Original Matt and Conserv-Art Gloss & Artists’ Matt Varnishcan be mixed to provide varying degrees of satin. Judging by the number of daily questions that we receive on the topic, there is either a vast population of artists varnishing paintings at all hours of the day, or a small number with a vast amount of uncertainty regarding the process. Or, some number of varnishing painters in the middle, each with at least a question or two. The answer to that is different depending upon the media in which you’ve painted. If the question is in regards to an oil painting, the answer is fairly simple: if you’ve followed all the rules of oil painting – fat over lean, slow drying over fast, thick layers over thin, all on a rigid, well-primed support – you’ll have a secure, durable paint film. For an acrylic painting, the need is even more immediate and clear. Why? Because, as the acrylic film approaches it final dry state, the last few evaporating water molecules don’t fully “close the door” on their way out, leaving micro-pores in the film. It’s these pores that cause the film to feel tacky, even when fully dry. Even more important, they remain open indefinitely, meaning that the porous acrylic film can freely accumulate dust, grime, and smoke from the atmosphere. While that grime may not seem to be much over a week or a month, it adds up over the course of years. The best way to protect the painted acrylic film? Varnish. We’re often asked about varnishes for water colour. When dry, water colour doesn’t form a discrete, intact film like oils or acrylics. In fact, water colour remains soluble when dry, and any applied varnish will “mingle’ with the colour layer, creating a film that is chemically and mechanically part of the painting surface. If, at some later date, the varnish yellows or is damaged and requires removal, the painting will come with it. Obviously, if you’re interested in long-term stability, varnish over water colour is a bad idea. The ideal varnish offers three qualities: one, superb clarity, two, remove-ability (or ‘reverse-ability,’ in conservation parlance), and, three; easy and even application. As a conservation grade varnish, Winsor & Newton ConservArt Gloss offers high clarity and the low-molecular weight acrylic/ketone resin ensures long-term remove-ability. In addition, UV stabilizers ensure film durability. Artists’ Original Matt Varnish is a removeable ketone resin/beeswax varnish that dries to a matt finish. Artists’ Gloss and Artists’ Matt Varnishes are removeable, non-yellowing and can be blended to achieve an intermediate gloss level. For acrylics, the vast majority of acrylic emulsion (water-based) varnishes on today’s market are – just like the acrylic emulsion colour – fully waterproof and non-removeable when dry. Winsor & Newton is the only manufacturer that makes three acrylic emulsion varnishes (Galeria Gloss Varnish, Galeria Satin Varnish and Galeria Matt Varnish) that are complemented with the Galeria Varnish Remover. When used properly, this alkali-based formula is specifically formulated to reverse Winsor & Newton acrylic emulsion varnishes without damage to the acrylic paint film beneath. When varnishing an oil painting, it’s essential to wait until the colour layer is fully dry and oxidized. That can require from six months to a year (or longer), depending upon the thickness of the film. How can you tell if the painting is ready to varnish? For answers to that and other frequently asked questions, see our FAQs. Acrylic paintings will dry and be ready for varnishing once water has fully evacuated from the film. Depending upon film thickness, that will require anywhere between two days and a number of weeks. 1) Use a 1”- 4” flat wide, soft, tightly packed, varnishing brush (such as the Winsor & Newton Monarch glazing/varnishing brush). Keep it clean and use it only for varnishing. 2) Place the work to be varnished flat on a table - do not varnish vertically. 3) Apply the varnish in 1-3 thin coats, rather than 1 thick coat. A thick coat will take longer to dry, may dry cloudy, drip or sag during application and has a greater chance of showing brush strokes when dry. 4) Thinned varnish is more susceptible to producing bubbles. Do not be vigorous in your application. 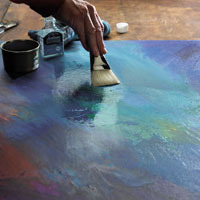 5) Apply in long even strokes to cover the surface top to bottom while moving from one side to the other. While working, inspect the varnish layer at all angles for bubbles. Even them out immediately. 6) Once you leave an area, do not go back over areas that you have done. If you do, you risk dragging partially dry resin into wet, which will dry cloudy over dark colors. If any areas were missed, allow to dry completely and re-varnish. 7) After varnishing, we recommend that the surface should be shielded from dust with a protective plastic film “tent”. 8) For a matte surface, apply the first layer(s) using gloss varnish. Because multiple layers of matte varnish will cloud, only the final layer should consist of the Matte varnish.